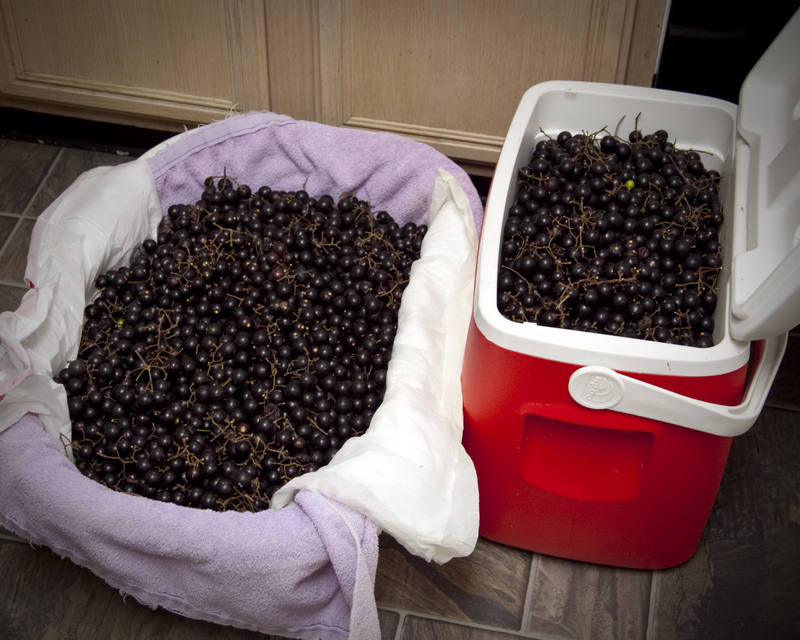 So I mentioned a couple posts ago that we obtained about a hundred pounds of Noble muscadine grapes. My dad made crap-tons of homemade wines. So did my grandfather…and my great-grandfather actually had a pretty cool winery in Sicily, which is another story entirely, saved for another day. So that makes THIS GIRL a fourth generation vintner, because it is obviously in my DNA, which is why I fervently pray that I do my dad, grandpa, and great-grandfather proud. We ordered a wine making kit (thanks, Dad! Best birthday check, EVER), and it came in on Thursday evening, after having washed and de-stemmed grapes for several evenings prior, fighting off the spiders and other bugs that came in with the grapes. I spent Friday evening with a plastic potato masher crushing grapes. It was like a sweet smelling bubble-wrap popping fest. Seriously. 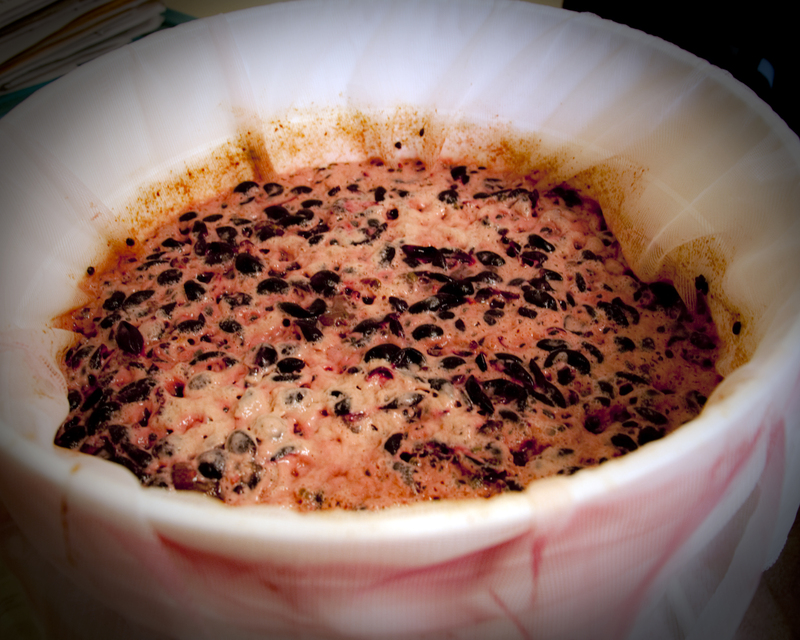 It took about two and a half hours to crush the entire batch, but I only used about 30-35 pounds for this batch of wine. The rest went into Zip-Lock gallon-sized freezer bags (which, when over-filled and placed in a freezer WILL explode, leaving a nice purple-y/lavender cast to a lot of your previously frozen items…trust me, I speak the truth). 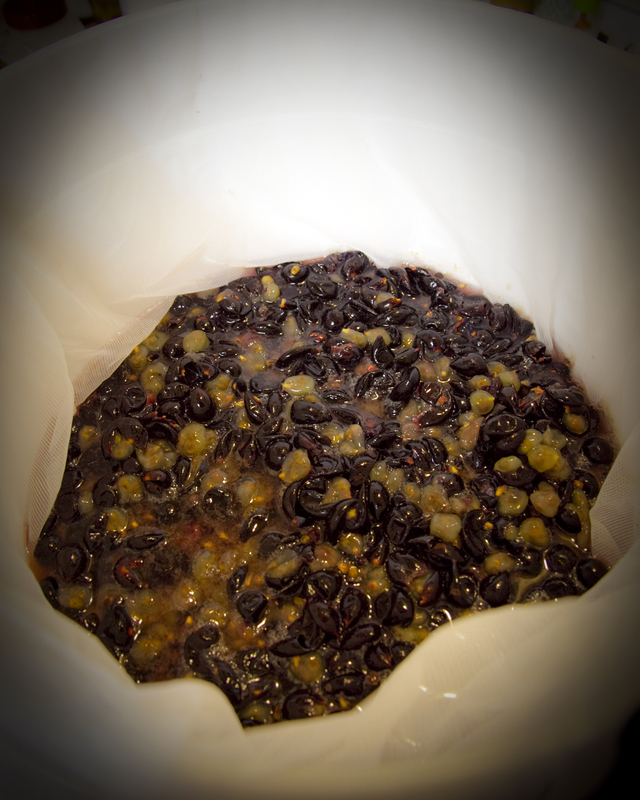 This is the must-bucket (aka primary fermeter, which is 7-some gallons) full of mushed up grapes and juice. Or partially full…I can’t actually remember when I took this particular picture. Once we got all the grapes and juice into the bucket (primary fermenter) we had to test for acidity, and used our little kit with the chemicals. Our acid was a little low, so I ended up placing ALL of our “acid blend” powder into the must. We were a few grams shy of what we needed, so planned a trip to the wine supply store (we use American Brew Master in Raleigh for our chemical and local equipment needs. If you’re in the area and need supplies? These guys. Seriously. Love them!). Then we tested the specific gravity…which, initially, confused the hell out of me, but thank goodness, I know how to use Google. We were a little off, so we added sugar by way of dissolving in water. I then gave it a good stir, (the hubs commenting on how I resembled a witch stirring a cauldron, thanks, Hon), and covered it up and walked away. Yeast wouldn’t go in for another 24 hours. Activated yeast with juice added, part one. Fast forward to Saturday. 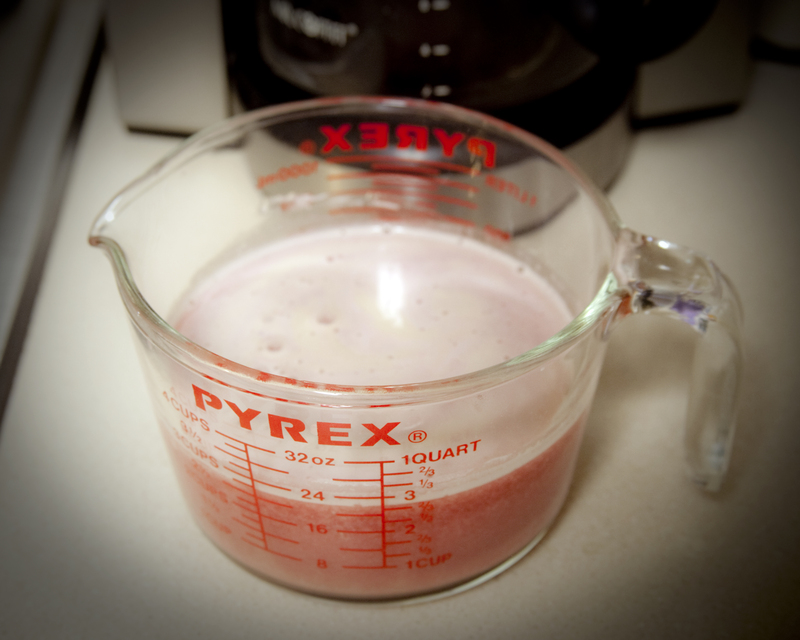 We activated five packets of yeast in hundred degree water and created a “starter” by putting an equal amount of juice to the liquid we used to activate the yeast. This is not a hurry-up kind of step. You have to give the yeast up to about 30 minutes (but no more than that) to activate. 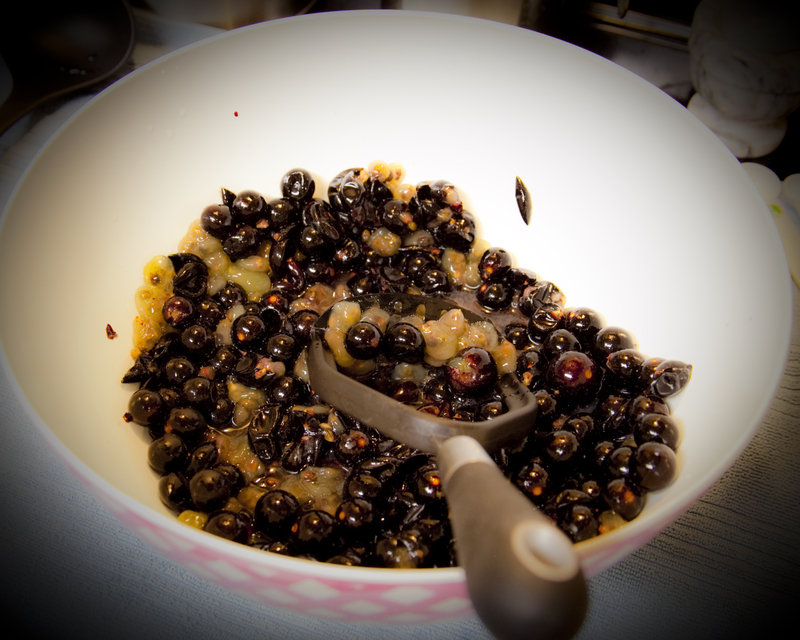 Then, once you add the juice, it takes about another twenty minutes to really get going. The reason for adding juice to the yeast/water mix is to ease the transition of the yeast (which is alive after reactivation) to the must. Apparently, if you just throw your activated yeast straight into the must, it over-stimulates the yeast culture and throws it into a yeast variation of a nervous breakdown, and that is no bueno. This is what our starter looked like after about fifteen minutes. See how the foam tripled (or more, because I cannot math, as I permanently has the dumb, which is why I rely on Google and a good calculator. Just sayin’). We got what we needed (did I mention how ridiculously NICE these guys are?) and went to Mom’s for tea and a visit. Got home and re-tested for acid (which was low) and for specific gravity, which was off. Turns out that we needed to add two pounds+ of sugar. This isn’t one of those things where you just TOSS a couple pounds of sugar then stir into your bucket, which, btw, is starting to smell a little boozy by now. Nope. 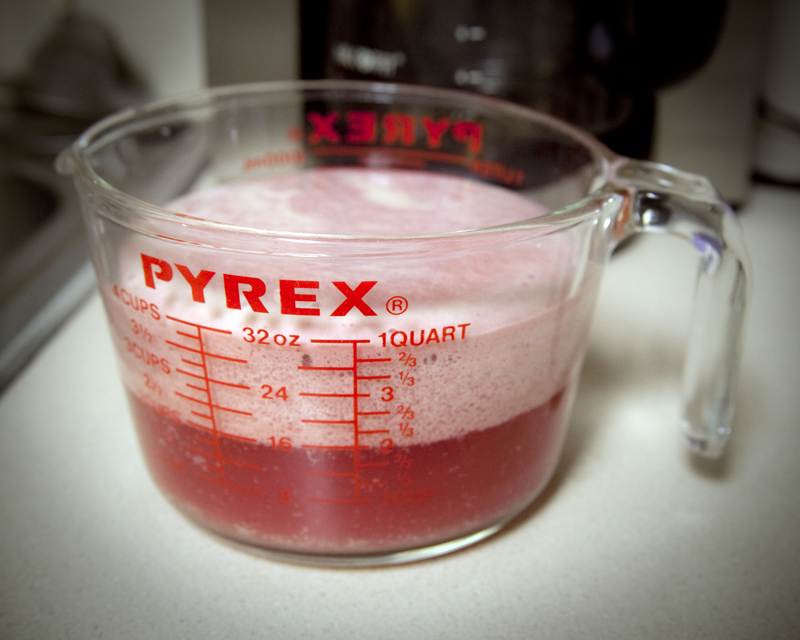 You need to use your wine thief to grab a sanitized pitcher full of stirred juice and gradually add sugar until it’s all dissolved. Yes…sterilization…You absolutely need to sterilize everything your must/juice/wine comes in contact with. Sterilizers come in no-rinse and you-need-to-rinse powders. I like the no-rinse ones, because you can make up batches and put them in spray bottles to sterilize the little things (test jars, stirring spoons, etc) after you wash them. This especially comes in handy when we will get to rubber tubing. I have both…rinse and no-rinse, and will save my no-rinse for the tubing. Ok, so after stirring, testing and adding the recommended amount of sugar, we watched the juice and yeast combination in our must bucket start to literally bubble. I have not seen a chemical reaction like that since chemistry lab in 2003. Seriously. We are stirring twice daily. 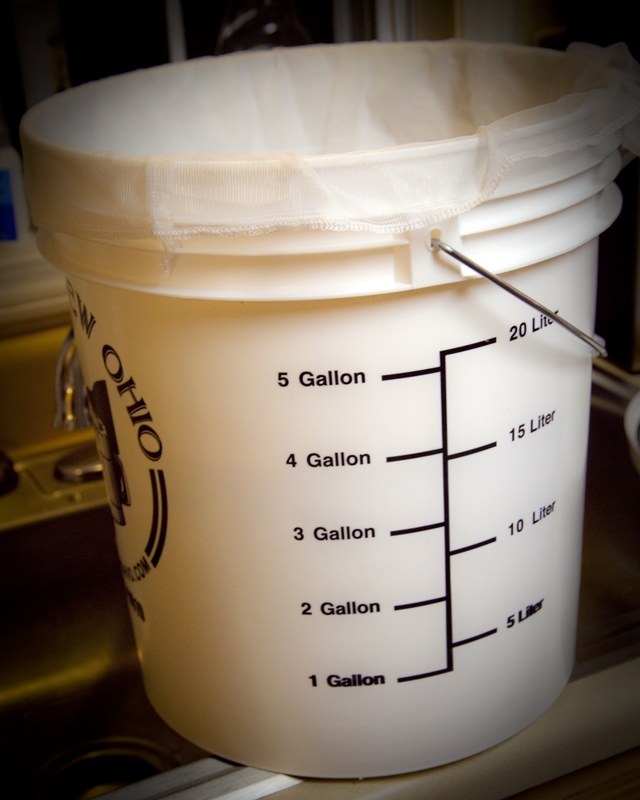 We are also testing the SG (specific gravity) daily, as well, so that we will know when to take the strainer bag out of the juice and be able to siphon our “wine” into our secondary fermenter, which is a six gallon glass carboy. This entry was posted in HomeMade and tagged acid blend, hydrometer confusion, pitching yeast for the newbie wine maker, wine making. Bookmark the permalink. I got dibbs on wine.